Under the 1982 Canada Health Act, health services deemed essential for all residents are universally paid for by the provinces. Canadian provinces, and others around the world, routinely collect data that allow them to administer health services provided to their populations. Generally, this spectrum of health administrative data includes information about people and their use of the health system, such as physicians’ billing claims, hospital discharges, emergency and ambulatory care, home care, complex continuing and long-term care, and claims for prescription drugs, for example. When linked to each other, these highly comprehensive data may be used to answer health system and research questions such as: Are those who require care getting the care they need? Is the care provided timely and based on evidence? What organizational aspects of the healthcare system could improve care? 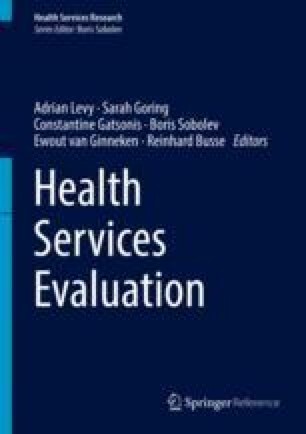 This chapter describes the uses of health administrative data for research, its benefits and limitations compared to traditional research data, the concept of linking datasets for health services research, emerging data quality scientific methods, and the caveats in interpreting administrative data. Issues of data governance and privacy, data documentation, and quality assessment are presented. These concepts will be illustrated through the example of the data held in the Institute for Clinical Evaluative Sciences (ICES) Data Repository in Ontario. Holt T, Jones T. Quality work and conflicting quality objectives. In: Quality work and quality assurance within statistics. Eurostat Proceedings; 1999. p. 15–24. http://epp.eurostat.ec.europa.eu/portal/page/portal/quality/documents/DGINS%20QUALITY%20Q98EN_0.pdf. Accessed 17 June 2014.